Our product range includes a wide range of Oerlikon Fluxofill Wire, Fluxofill-66 Flux Cored Wire, Fluxofill Wire, Fluxofill - 66 and Ferro Molybdenum. Oerlikon Fluxofill Wire is a seamless copper coated basic flux cored wire for the welding of high-strength fine grain structural steels. Operating features include low spatter loss, easy slag removal, and uniform bead appearance. 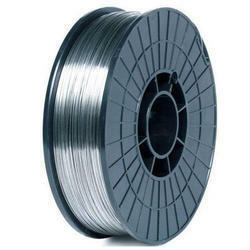 Fluxofill-66 Flux Cored Wire is a seamless copper coated slagless metal-cored wire for high hardness wear overlay. Suitable for roll-type crushers, worm conveyors, scraper blades, dipper teeth etc. The weld metal is crack resistant and highly resistant to impact and abrasion. In the case of thick overlays, it is recommended to weld only the last two layers with Fluxofil 66 and to use Fluxofil 31 or the Ffluxofil 35 for the preceding passes. Machining by chip-forming is not possible with this weld metal. The weld deposit contains hard phases in the form of special carbides. Fluxofil Wire is a seamless copper coated basic flux cored wire for the hardfacing of wear parts, such as excavator parts, scraper blades, dipper teeth, worm conveyors, beaters, crusher jaws, crusher cones, subjected to heavy wear. The weld metal is tough and free of cracks and therefore resistant to shock and impact. Machining is only possible by grinding. A tough buffer layer using Fluxofil 31 is only required with highly hardenable base metals. 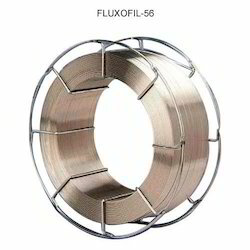 Fluxofil - 66 is a seamless copper coated basic flux cored wire for the welding of high-strength fine grain structural steels. Operating features include low spatter loss, easy slag removal and uniform bead appearance.